Steamfry onions in a saucepan until golden. Add garlic and cook for an additional minute. Add in the corn and kale and cook until the kale has wilted. Turn off heat and let mixture cool a bit. Slice zucchini and set aside. Grate/process the cauliflower (to a rice like consistency) in a food processor. Add the cauliflower, zuchini, onions/garlic/corn/kale mixture to the dry mix, then add the water and mix well. The mixture should be thick and clumpy. Spoon the mixture into a 13x9 glass pan and press firmly into the pan, but leave the top rough for texture. Bake for approximately 1 hour. If the top is getting too brown, lightly cover with foil. OK... I have an idea. :) I made this recipe and we loved it and the consistency reminded us of the corn spoon bread that I used to make back in my evil food days. It was not Vegan. It was full of eggs and full fat dairy, but we loved it. It called for Jiffy Corn Bread Mix, 1 can of creamed corn (undrained), 1 can of regular corn (drained), sour cream, and possibly eggs and butter. All terrible by my standards 4 years later! However, I think your yummy casserole recipe could be changed by subbing corn meal for the chickpea flour, adding more frozen corn, etc... but that's where my imagination stops. Ugh! Alas, I am not a good recipe developer! 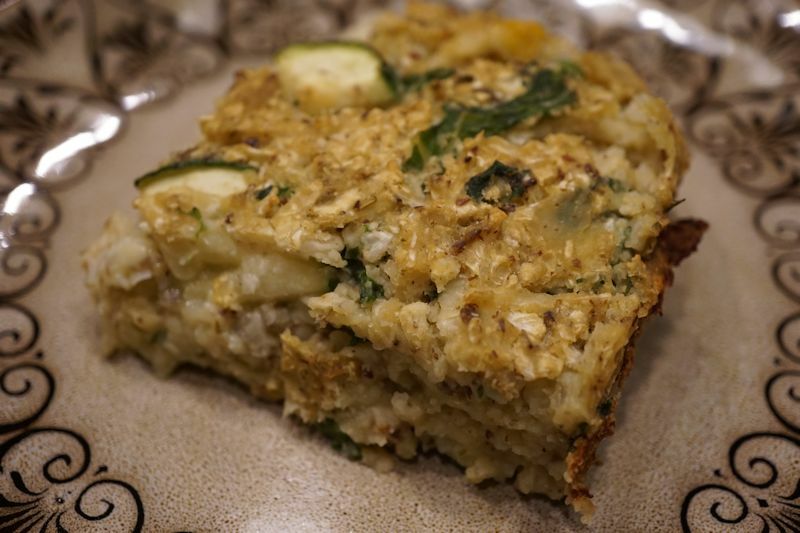 If you ever come up with a Vegan version that is moist and light and yummy like this recipe, I, and possibly many others, would be thrilled!! A friend who tried it suggested the same thing! For me (as a diabetic) the chickpea flour adds resistant starch which keeps blood sugar from spiking, which is why I thought the original recipe looked good for me. However, I agree, this could easily make for a healthier corn casserole! Maybe a good holidays dish? You are my new hero! This was absolutely delicious!! EVERYONE at dinner loved this. What a treat to make a recipe that actually is really good! I look forward to trying many more of your dishes. Thank you! So glad you enjoyed this recipe! Please let me know how other dishes are received by your family. I am always tweaking! I made this last night and it was wonderful! I had never used chickpea flour before. Thanks for another winner! Sarah...I am SO glad you enjoyed it! I have a recipe coming out for the holiday issue of VegWorld Magazine that I think you will love. It's a Creamy Hash Brown Casserole. Be looking out for it! HUGS! where I could get a captcha plugin for my comment form? I'm using the same blog platform as yours and I'm having difficulty finding one?